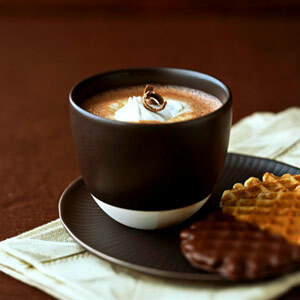 Jill Prescott of Wisconsin's former Ecole de Cuisine cooking school created this heavenly take on hot chocolate. We used dark chocolate to make this hot drink. Enjoy it for a sweet snack or as dessert. In a heavy large saucepan, heat the milk and cream over medium heat until hot, but not boiling. Remove from heat. Using the tip of a paring knife, slit the vanilla beans down the center. Using the side of the knife, scrape out the seeds. Place seeds and vanilla pods into the hot milk mixture. Cover and chill. Allow the vanilla pods to infuse the milk with their flavor for at least 2 hours or overnight. When ready to make the hot chocolate, remove the vanilla pods and using two fingers press the milk out of the bean to extract all the seeds; discard pods. Heat the milk mixture over medium heat until hot, but not boiling. Add the chocolate. Whisk until the mixture is smooth and chocolate is melted. Add sugar to sweeten, if you like. Top with whipped cream.